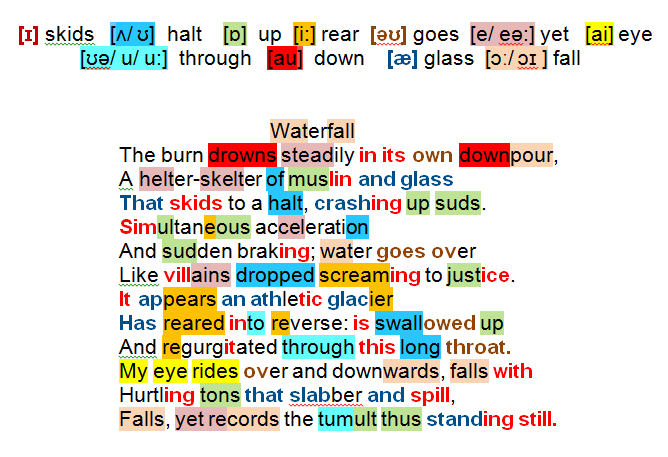 The power, texture and formats of flowing water present Heaney with the challenge of transposing the visual turbulence and disorder of a waterfall into words. Feel and finish are important in a poem that deploys a wide range of sense data. Heaney clarifies the process in the final triplet. The poet’s attention has followed a water course (burn) to a point above a waterfall where the pressure of water overwhelms it (drowns steadily its own downpour). A maelstrom confusion of textures and light-effects is added (helter-skelter of muslin and glass); unseen obstacles cause skids and go-slows that throw up frothy soap-like suds. The cataract generates contradictory momentum (acceleration … braking). The irresistible gravitational effects injected at the moment the water plunges into the void remind Heaney of classical Renaissance paintings in which the sinful are pitched into the fiery furnaces of Hell Like villains dropped screaming to justice. The water’s rebound is likened to an athletic glacier …/ reared into reverse and the stream’s channel a long throat, with constant influx (swallowed) and reflux (regurgitated). Heaney clarifies the poetic challenge: his words, caught up in a turmoil of events, dragged over the brink alongside Hurtling tons that slabber and spill, are frozen into a single poetic frame, recording the tumult thus standing still. the glacier metaphor makes sense of the final image: the ice-field has colour and texture; importantly, it has no visible movement.